Summertime Halo: A colourful circumhorizon arc spans the sky near Fredericton, New Brunswick, Canada. The halo lights brightest where the cirrus is thickest. Note the enormous size of the halo and its pure spectral colours. Imaged by Marc Sorensen in the summer of 2003. Image ©Marc Sorensen, shown with permission. 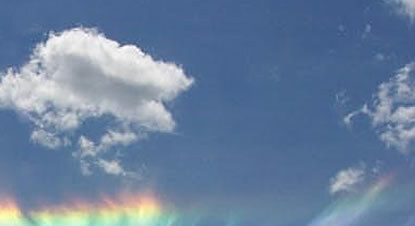 Look for the brightly coloured circumhorizon arc (also a circumhorizontal arc but never 'fire rainbow') when the sun is very high in the sky - higher than 58°. Near to noon in mid summer is a good time in middle latitudes. The halo is beneath the sun and twice as far from it (two hand spans) as the 22º halo. It is a very large halo and always parallel to the horizon. 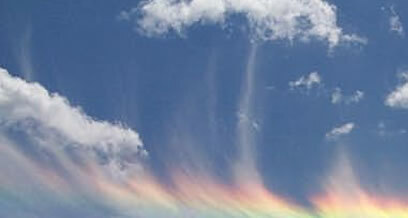 Often only fragments are visible where there happen to be cirrus clouds - the individual patches of cirrus are then lit with colour that can be mistaken for iridescence. 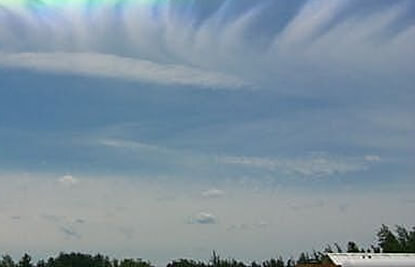 High sun infralateral arcs occupy a similar position in the sky. 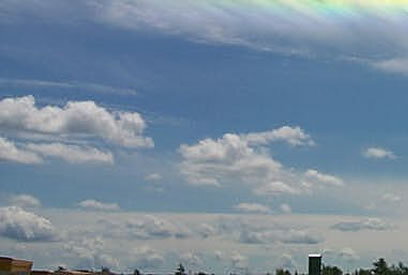 The infralateral arc curves upwards from the horizon slightly and this is best checked for visually because lens distortions invariably also show the circumhorizon arc as curved. The rarity, or otherwise, of the arc depends on where you are. At medium latitudes like much of the USA it is not rare - it can be seen several times each summer. In contrast, further north in much of Europe the circumhorizon arc is a rarity and impossible to see north of Copenhagen. See the charts in 'How rare?' for the visibility at your location. ** 'Fire rainbow' - This unrecognised name appears to have been coined by a journalist after the great 2006 Spokane display. The halo is not a rainbow and has nothing to do with fire.